One night at a bridge, the Joi terrorist Kotaro Katsura is attacked by a ronin. Katsura's comrade, Elizabeth, goes to the freelancer trio Yorozuya requesting for their help in finding Katsura. 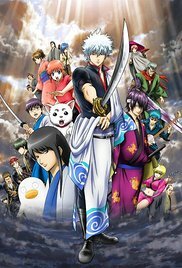 While Shinpachi Shimura and Kagura to search for Katsura, Gintoki Sakata receives a request from the swordsmith Murata Tetsuya to retrieve the cursed sword Benizakura which has been stolen to commit serial murder. Shinpachi and Elizabeth are ambushed by the assassin Nizo Okada, a previous antagonist known to the Yorozuya as Nizo the Butcher, who claims to have killed Katsura, showing them the hair he cut off. Gintoki comes to protect Shinpachi and Elizabeth but is overwhelmed by Nizo and the Benizakura, which is revealed to be no ordinary cursed sword. Before Nizo lands another fatal hit on Gintoki, Shinpachi slashes off one of Nizo's arms, forcing the latter to retreat when people started to gather at the commotion. Read more on Wikipedia.